SophisTex classifies its solutions into three different categories: Developer Frameworks, Technical Solutions and Functional Solutions. Our Functional Solutions are leveraging Developer Frameworks and Technical Solutions. Combining all three with customer specific implementations result in large-scaled applications in the SAP PLM area. Generic Recipe Calculations (GRC) for SAP PLM 7 WebUI Recipe Development offers a fully configurable and integrated environment for recipe calculations. Formulas & calculations can be managed decentrally by business users with the help of Business Rule Framework+ (BRF+). Customer enhancements are possible via BAdIs and a consistent look & feel is supported by Smart Formula Evaluation. This is the formula calculation solution that all your Recipe Development users have been waiting for. Your department is using SAP PLM 7 Recipe Development but needs extensive calculation functionality to fulfill your customer requirements and ensure legal compliance. Unfortunately, this calculation functionality is not provided by the SAP standard and you do not want to implement a customer specific solution that has fixed calculation and has high maintenance/enhancement effort. 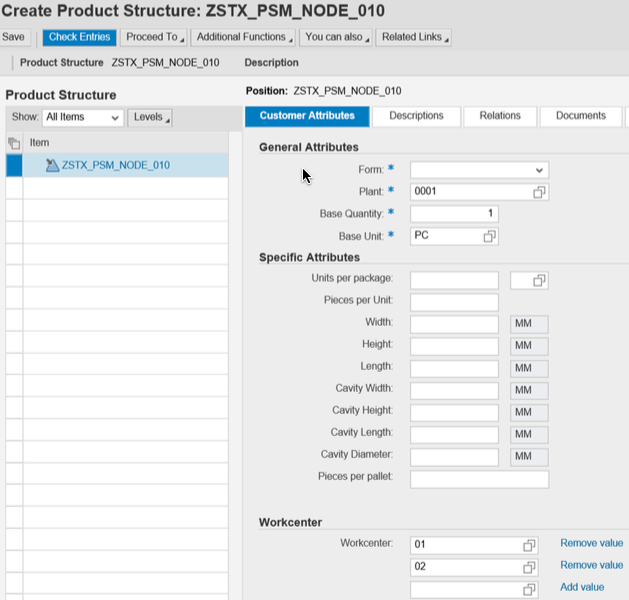 Generic Recipe Calculations (GRC) for SAP PLM 7.x Recipe Development offers a fully configurable and integrated environment for recipe calculations. Formulas & calculations can be managed decentrally by business users with the help of Business Rule Framework+ (BRF+). Customer enhancements are possible via BAdIs and a consistent look & feel is supported by Smart Formula Evaluation. Please also see our productive customer references for GRC. The PLM 7 Basis Developer Frameworks offer basis utilities with easy-to-consume DDIC services, user services, number ranges and GUID utilities. The framework contains a user interface bundle with lean ALV and hierarchical ALV components for SAPGUI and WebDynpro. It includes a message handling framework for SAPGUI and WebDynpro (including FPM) as well as the SophisTex Switch Framework. Many basis services are available in SAP basis core components, but they are spread across many different packages and are often not easy to consume. Developers can easily spend days on trying to find the appropriate basis service and figuring out how to call it in the right way. When adding user interface topics, the effort multiplies with light speed. The SophisTex PLM 7 Basis Developer Frameworks offer a lean and compressed view on all these services. All important basis functionality is encapsulated in easy-to-consume methods. Searching through the jungle of basis functionality? Yesterday's problems with our Basis Developer Framework. The PLM 7 Bill of Material Developer Framework leverages our Developer Framework architecture. It encapsulates all business and user interface logic and offers an easy consumable approach for the Bill of Material Business Object in SAP PLM 7. Every SophisTex Developer Framework is delivered with detailed documentation and code snippets showcasing the correct consumption and necessary calls. It enables even unexperienced developers in the area of PLM Material BoM to read, change and operate on MBoM data. Service & support is available in accordance to our maintenance contracts. SAP implementation projects usually require enhancements to the standard logic. This is valid for SAP PLM / PLM 7 as well as other functional solutions and modules. While the business requirement is clear prior to implementation, developers with the specific knowledge of the certain business functionality are hard to find. Even experienced developers need a considerable time to learn about the specific interfaces, business objects, persistence and user interface functionality. Thus, every implementation project spends a considerable amount of time rather on educating the development staff, instead of developing the actual requirements. Eventually the development staff is familiar with all interfaces and specifics. However, functionality still needs to be linked and consumed together to fulfill the project requirements. Another considerable amount of effort is spent on linking SAP standard functionality and creating service methods that provide the desired logical functionality. The SophisTex Bill of Material Developer Frameworks does not only offer encapsulated standard functionality but also linked functionality with lots of logical enhancements, everything ready-to-consume in no time. 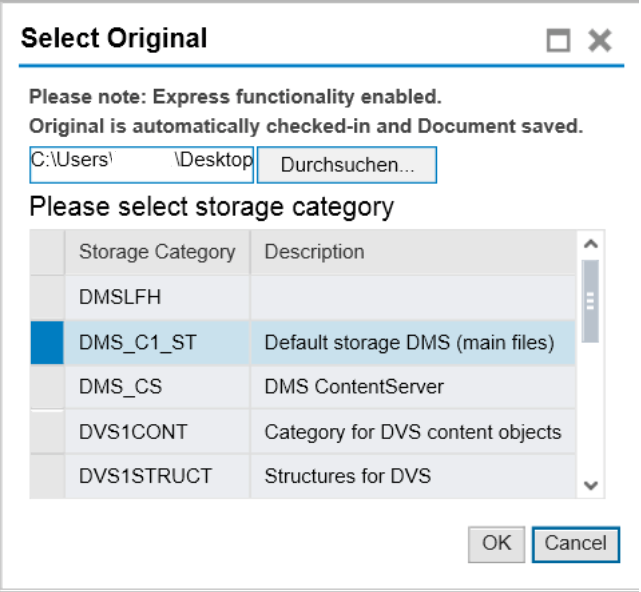 Document Control+ for PLM 7 bundles Document enhancements in one solution and offers a full disablement of the ACL Whitelist functionality including deactivation of ACF Java Applets. Express upload functionality seamlessly integrated into the standard Document WebUI directly uploads originals and checks them in. Furthermore, a stand-alone WebDynpro application offers lean and simple express creation of Document Info Records (DIR) with and without originals. The Document WebUI included in the SAP PLM 7 suite offers a full featured and feature rich web user interface. However, the Whitelist functionality need to upload and download originals (files) to Documents can be troublesome dependending on the implementation scenario. It is loading Java Applets that can cause the used browser to freeze or crash. Whitelist distribution across all clients is always a pain-point and the Whitelist functionality cannot be deactivated in SAP standard. The feature rich WebUI may also be too complex for some occasional users or for some use case scenarios. The PLM 7 Document Developer Framework leverages our Developer Framework architecture. It encapsulates all business and user interface logic and offers an easy consumable approach for the Document Info Record (DIR) Business Object in SAP PLM 7. Every SophisTex Developer Framework is delivered with detailed documentation and code snippets showcasing the correct consumption and necessary calls. It enables even unexperienced developers in the area of PLM Document to read, change and operate on Document data. The SophisTex Document Developer Framework does not only offer encapsulated standard functionality but also linked functionality with lots of logical enhancements, everything ready-to-consume in no time. The PLM 7 Document Developer Framework is consumed and leveraged by the SophisTex Document Control+ Functional Solution. The PLM 7 Engineering Change Number (ECN) Developer Framework leverages our Developer Framework architecture. It encapsulates all business and user interface logic and offers an easy consumable approach for the Engineering Change Number Business Object in SAP PLM 7. Every SophisTex Developer Framework is delivered with detailed documentation and code snippets showcasing the correct consumption and necessary calls. It enables even unexperienced developers in the area of PLM ECN to read, change and operate on ECN data. The SophisTex Change Number Developer Framework does not only offer encapsulated standard functionality but also linked functionality with lots of logical enhancements, everything ready-to-consume in no time. The PLM 7 Material Developer Framework leverages our Developer Framework architecture. It encapsulates all business and user interface logic and offers an easy consumable approach for the Material Business Object in SAP PLM 7. Every SophisTex Developer Framework is delivered with detailed documentation and code snippets showcasing the correct consumption and necessary calls. It enables even unexperienced developers in the area of PLM Material to read, change and operate on Material data. The PLM 7 Product Structure Management (PSM) Developer Framework leverages our Developer Framework architecture. It encapsulates all business and user interface logic and offers an easy consumable approach for the PSM Business Object in SAP PLM 7. Every SophisTex Developer Framework is delivered with detailed documentation and code snippets showcasing the correct consumption and necessary calls. It enables even unexperienced developers in the area of PLM Product Structure Management to read, change and operate on PSM data. The SophisTex Product Structure Management Framework does not only offer encapsulated standard functionality but also linked functionality with lots of logical enhancements, everything ready-to-consume in no time. The PLM 7 Recipe Developer Framework leverages our Developer Framework architecture. It encapsulates all business and user interface logic and offers an easy consumable approach for the Recipe Business Object in SAP PLM 7 Recipe Development. Every SophisTex Developer Framework is delivered with detailed documentation and code snippets showcasing the correct consumption and necessary calls. It enables even unexperienced developers in the area of PLM Recipe Management / Recipe Development to read, change and operate on Recipe data. The SophisTex Product Recipe Developer Framework does not only offer encapsulated standard functionality but also linked functionality with lots of logical enhancements, everything ready-to-consume in no time. Manipulate calculation results by SAP RD parameters (quantity, effectivity, valuation rating and validity area). The PLM 7 Specification Developer Framework leverages our Developer Framework architecture. It encapsulates all business and user interface logic and offers an easy consumable approach for the Specification Business Object in SAP PLM 7 Recipe Development. Every SophisTex Developer Framework is delivered with detailed documentation and code snippets showcasing the correct consumption and necessary calls. It enables even unexperienced developers in the area of PLM Specification o read, change and operate on Specification data. The SophisTex Specification Developer Framework does not only offer encapsulated standard functionality but also linked functionality with lots of logical enhancements, everything ready-to-consume in no time. 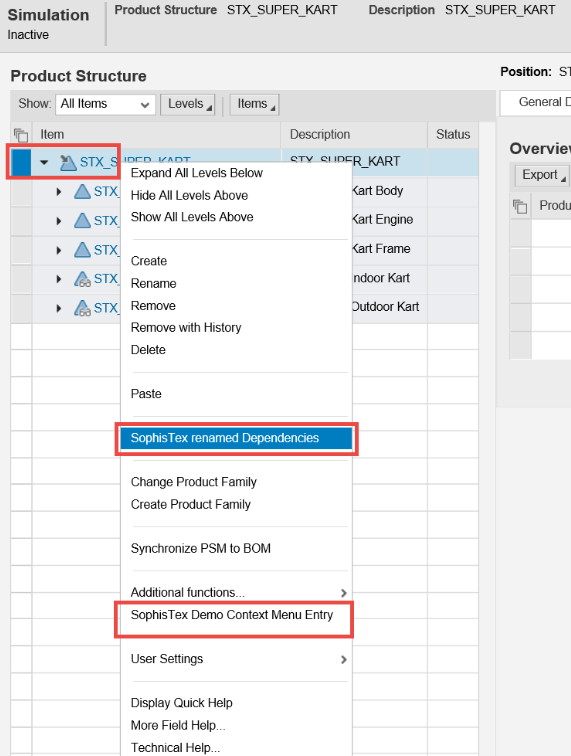 The SophisTex solution Customer Attributes for SAP PLM Product Structure Management offers a generic approach to store and display information in SAP PLM 7 Web PSM and optionally als in SAP iPPE in SAPGUI. It offers huge flexibility with a role-based display of the attributes, the definition of view groups with filtering and splitting functionality, offers a sophisticated multi-value support and is fully integrated with all DDIC functionality. 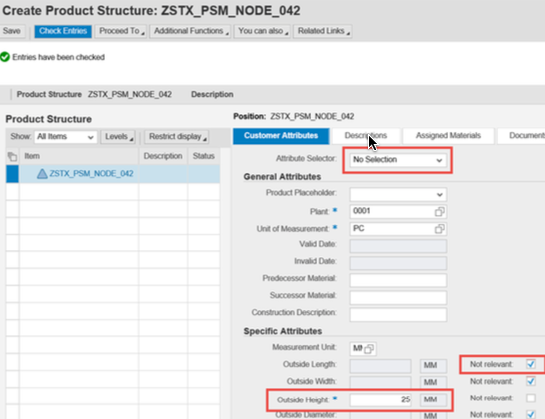 The SAP PLM 7 WebUI Product Structure Management (PSM) application offers a very generic data model, but no generic approach to customer specific attributes. The SAP classification system with characteristics values can be used, but it does not offer enough flexibility for most customer requirements such as a role-based display of attributes, a specific view layout showing and hiding attributes, or having flexible mandatory attributes. Our solution offers a very generic approach that fulfills all requirements when it comes to custom attribute handling in the PSM environment for the technical objects Node, Relations and Variants (iPPE / PSM objects). 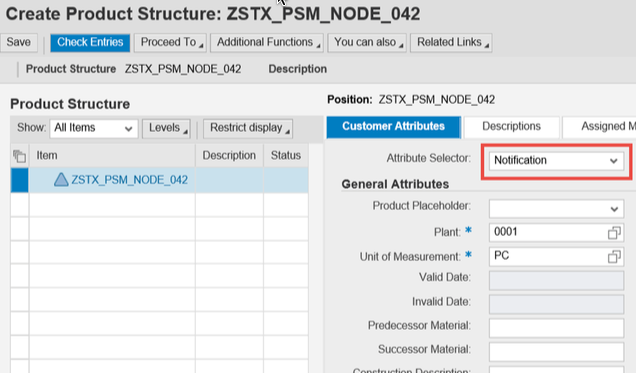 The SophisTex solution Customer Attributes for SAP PLM Product Structure Management offers a generic approach to store and display information in SAP PLM 7 Web PSM and optionally in SAP iPPE in SAPGUI.